Rogue Sky is a game we desperately wanted to love, but wound up despising. Chillingo and Pebble Bug Studios' latest project has a superb presentation, filled with stylish graphics and music. Sadly, video games don't receive high scores for snazzy visuals and a well composed soundtrack. 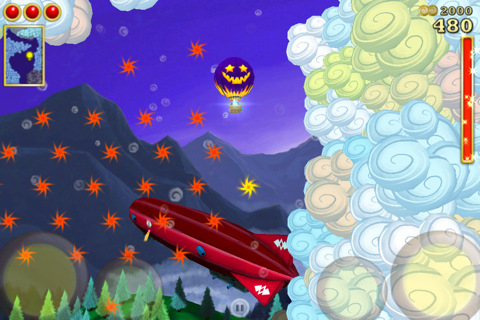 What we have here is a hybrid of flying and shooting, centered on hot air balloons with creepy looking faces. 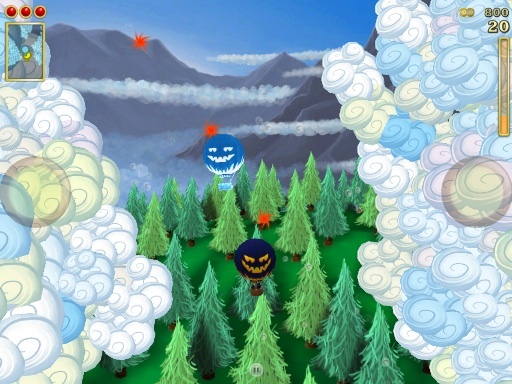 Your goal is to guide one particular balloon through mazes of clouds, using the realistic physics to skillfully dodge floating mines and dangerous thunderclouds while unleashing cannon fire upon rival balloons. Controls are simple enough. You tap the left and right on-screen buttons to move in those respective directions, then press them at the same time to ascend. Thing is, the balloon behaves as it should, and therein lies the problem. We think this is one of the few games where accurate physics hinder the user's overall enjoyment. Bottom line, the app's too difficult. The learning curve is so steep that we often quit out of frustration. Press a little too much, and the balloon gets zapped by one of the aforementioned thunder clouds. Wander too close to a red mine, and it gives chase, eventually blowing up and sending you back to the level select screen. Now throw in enemy balloons, also equipped with cannons, and the game becomes one big chore. Ultimately, it all boils down to the developers' decision to go with balloons, not the most easily controlled objects. It's tough maneuvering something that floats through obstacle courses filled with projectiles and lightning. To its credit, Pebble Bug Studios did a bang up job with the stylish graphics, and as we said, the music's great. At the same time, Rogue Sky isn't much fun, and ultimately, that's what matters. Requirements: Compatible with iPhone 3GS, iPhone 4, iPod touch (3rd generation), iPod touch (4th generation), and iPad. Requires iOS 3.1 or later. What's Hot: Stylish graphics, dramatic music, creepy looking balloons. What's Not: Too difficult, iPad version costs $1 extra.